Learn to defend yourself in any situation! Eskrima, Kali, Silat, and Arnis are umbrella terms for the traditional martial arts of the Philippines that emphasize weapon based fighting with sticks, knives, other bladed weapons and various improvised weapons. It also includes hand to hand combat (Panantukan, Dumog, etc.) and weapon disarming techniques. Though Filipino martial arts are practiced by people of all sizes, they are especially well suited for women or smaller individuals, since a weapon tends to equalize size differences. Silat is a collective word for indigenous martial arts of the Indonesia, Malaysia and Southeast Asia, it is also traditionally practiced in parts of the Phillipines. As with Filipino Martial Arts, there are hundreds of different styles but they tend to focus either on strikes, joint manipulation, throws, bladed weaponry, or some combination thereof. Some of the Silat styles that we practice focus on techniques from standing position others incorporate striking, locking and throws from standing, kneeling or from the ground. The Filipino Martial Arts are some of the most street-smart, battle-worthy and graceful flowing systems in the world today. Filipino Martial Arts have been honed thru centuries of tribal warfare and defense from invading forces. These arts have continued to evolve in modern times with multitudes of practitioners all over the world and are now featured in the fight choreography of many popular action movies. Kali and Filipino Martial Arts are unique in that training normally begins with basic weapon training. Why do we teach Filipino Martial Arts? The movements learned can be used empty hand or with any improvised weapon. Though this may sound counter intuitive, if you think about it, this is the way basic training works for soldiers. They first train with their weapon. Empty hand combat is considered a last resort. At Kensho, Kali and Silat training provide the keys to applying our various Muay Thai and kickboxing skills to real world combative situations. As with JKD, the idea is to learn to “go with the flow”. If you can’t defend yourself with a weapon, does it really make sense to think that you’d be able to defend yourself without a weapon? In class you will learn moves from various Filipino Martial arts disciplines and train with weapons. This will help develop skills to apply in real life situations. Students should purchase their own escrima sticks for class, though sticks are available to borrow for new students. 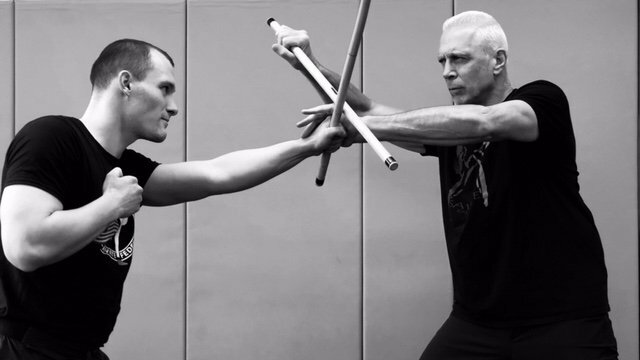 Escrima and Kali training will help you develop a flow that helps tie together the other martial arts disciplines that you’ll learn at Kensho Martial Arts. Try Kensho Chicago’s Filipino Martial Arts classes.